Carve Me A Bear! 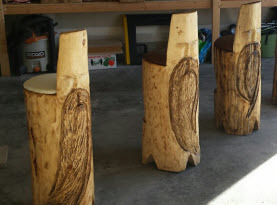 Chainsaw Carvings specializes in chainsaw carvings out of pine, redwood, ponderosa, cottonwood, and other fine woods. 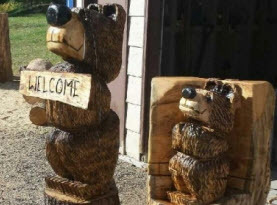 Clark the Carver has been crafting wooden treasures for over 30 years, honing his skills to create beautiful masterpieces of Bears, Dogs, Birds, Horses, Moose, Mascots, Owls, Raccoons, Coyote, Wolves, Bunnies, Squirrels, Lions, Chickens, Pigs, Eagles, Garden Wizards, Mountain Men, Cowboys, Indians, Tiki’s/Totem Poles, Furniture such as Benches and Tables, Custom Order Signs, Mantels, Flower Pots, Memorial Planters and much more! Carve Me A Bear! 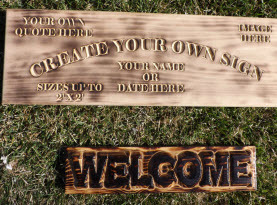 Chainsaw Carvings also takes custom orders. 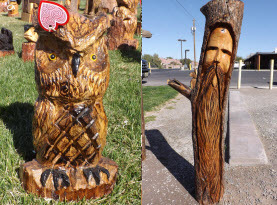 Whether you have a passion for collecting or know someone who does, our carvings make perfect gifts to loved ones or even yourself! Bunnies, or rabbits, are one of many adorable critters implemented in Clark the Carver of Carve Me A Bear! Chainsaw Carvings many works. Many folks can’t help but be drawn to their curious little nose twitches, the delightful sight of floppy years, their soft fur, and cotton tails. It’s a no wonder many people love to them as beloved pets. Bunnies and rabbits are actually one in the same, nothing really separates the species. Bunnies are often in reference to baby rabbits. There is a difference between a rabbit and a hare however. Both rabbits and hares are lagomorphs which also include the pika. They look like large mice, burrowing much like a rabbit and living in colder climates. Before 1912 Lagomorphs were originally classified as rodents, but since then a distinction has been made between them. Hares are born with their eyes open, have fur covering up their bodies, and within a few minutes of birth can already start to run. One of the differences is that rabbits are born blind, furless, and remain in an intricate constructed fur-lined nest for the several days following their birth. Jackrabbits, or Lepus, can run at amazing speeds and have been clocked at speeds of 45 miles per hour. Formally, a male rabbit is called a buck, a female rabbit is known as a doe, and a baby rabbit is called a kit. When there is a group of rabbits living together, they are known as a herd. In many cultures and religions, rabbits have become a symbol of fertility because of their great ability to reproduce quickly and in large numbers. This symbol became associated with Easter among Christians. A rabbit’s litter is usually between 4 and 12 babies, and the gestation period is only 30 days. Male rabbits are capable of reproduce=ing as early as 7 months of age, and females have been known to reproduce as early as 4 months old. Basically within one year a single female rabbit can produce as many as 800 children, grandchildren, and great-grandchildren. For those who enjoy rabbits as pets, it is good to know that they are meticulously clean animals and are easy to house break and train. With a pet rabbit, much like a dog, with proper training they can be taught to respond to their name, do simple tricks, and enjoy sitting in laps for some love and attention. When a bunny shows their happiness, they perform cute behavior commonly referred to as binky, which is when they jump up in the air, twist and spin around! If you are one of many people in the world who simply adores rabbits or know someone who is, check out Carve Me A Bear! Chainsaw Carvings selection of bunny sculptures and get your custom designed order today!